Raine Logistics Inc. trucking and transportation. Are you a business owner in need of a shipping company you can trust to provide top tier intermodal trucking services? Let Raine Logistics Inc. be the one to get your package where it needs to go! Raine Logistics Inc. is a company specializing in hot shot trucking deliveries. We are dedicated to providing, reliable, safe, and on schedule hot shot transportation and deliveries. Because we are an independent transportation contractor, we have the flexibility to meet the needs of our customers and make sure that their freight gets where it needs to be when it needs to be there. People hire a hot shot trucking company when they need their shipment to be delivered as soon as possible. Raine Logistics Inc. is your choice for fast and reliable local delivery. We have provided businesses in our area with all their local delivery needs for many years. We take great pride in our commitment to offering our clients comprehensive pickup and delivery solutions, customized to their exact needs. We know that in the world of business, time is money, which is why we’re here for you 24 hours a day, 7 days a week. Whether you need something shipped across town or across the country, if the shipment doesn't require an entire truck's worth of space, why pay for it? With less than truckload services from Raine Logistics Inc., you can experience the same security and efficient service, at a price that suits your budget and shipment size. At Raine Logistics Inc. we understand that our clients have many different needs when it comes to freight transport. That is why we offer not only a reliable transportation services but also storage facilities. Our logistic experts understand very well that not every client has the same schedule of getting products on the road towards their destination as soon as possible. Often clients have long term plans for the goods they need transported and those plans require storage. 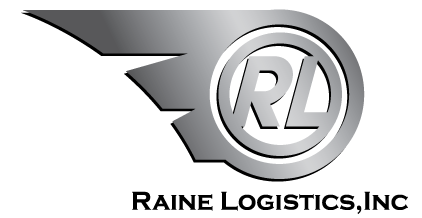 Raine Logistics Inc. is a specialty trucking and transportation company that handles shipments that most trucking companies simply can’t handle. If you have freight that requires special equipment or other considerations that are out of the ordinary, you can count on us to get your goods delivered securely and on time with special attention to detail. We pride ourselves on offering the best possible specialty services to our customers that are customized to fulfill any unique requirement.